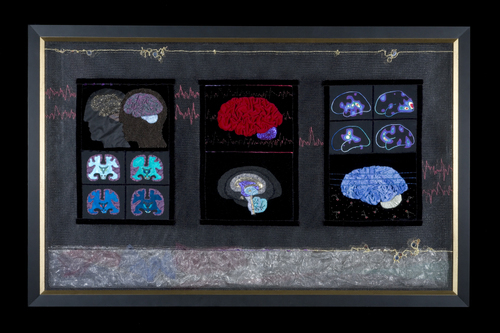 The museum exhibits the world's largest collection of anatomically correct fabric brain art, inspired by research from neuroscience, dissection and neuroeconomics. 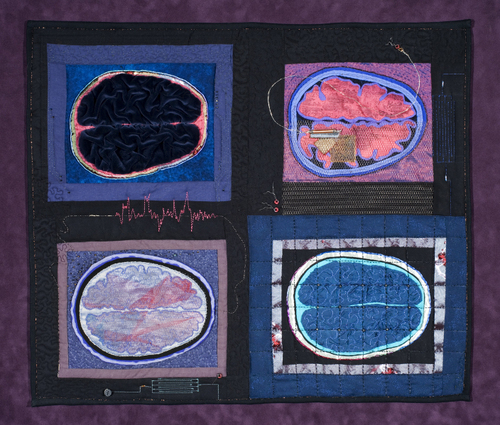 Our current exhibition features three quilts with functional images from PET and fMRI scanning, a knitted brain, and two fabric pieces interpreting single neuron recording. The artists are Marjorie Taylor , Karen Norberg, and Patricia Jauch. Techniques used include quilting, applique, embroidery, beadwork, knitting, and crotcheting. Materials include fabric, yarn, metallic threads, electronic components such as magnetic core memory, wire, zippers, and beads. For more details, try here and especially here. BEAUTIFUL BRAINS. 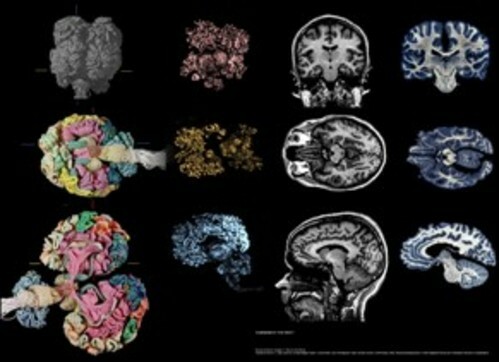 To neuroscience researchers, the human brain is a complex organ riddled with mystery. 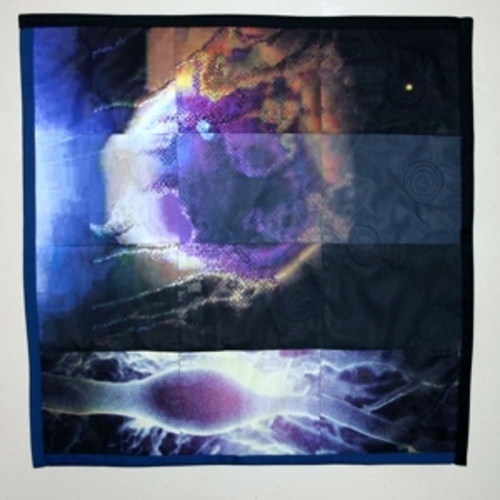 But to developmental psychologist Marjorie Taylor and psychiatrist Karen Norberg, it's also an inspiration for unique quilts, knitting, and other work that they showcase in an online museum of "scientifically accurate fabric brain art." The two were drawn to the niche independently. Taylor (right), a professor at the University of Oregon, Eugene, had been making quilts on the side for years before she turned her needle to neuroscience. 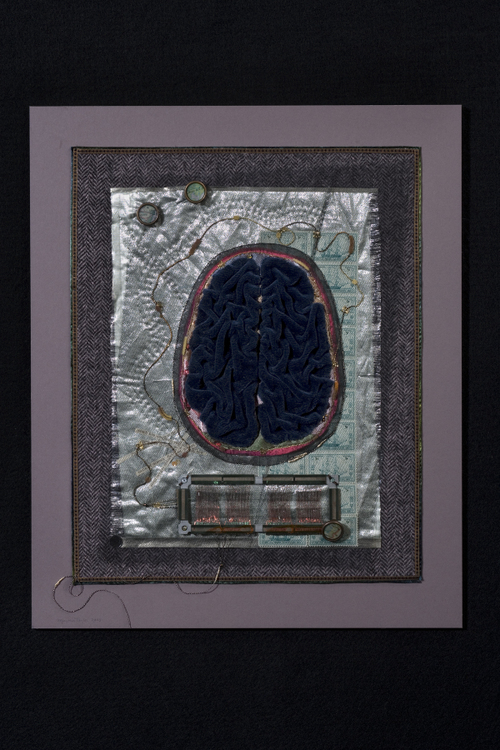 Struck by the cover images of journals like Cerebral Cortex, she began reproducing them in fabric, creating pieces that--for example--show positron emission tomography scans of the brain's response to hearing or seeing words. 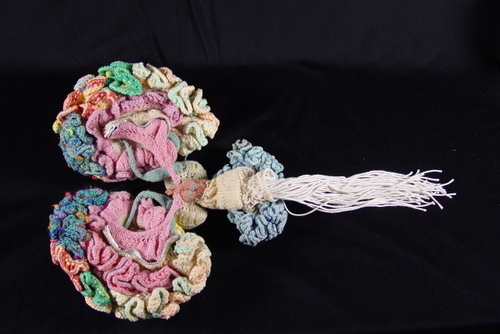 Karen Norberg (left), who works at the National Bureau of Economic Research in Cambridge, Massachusetts, says she began knitting a brain (above) to kill time when she was undergoing clinical training in child psychiatry. The product now resides at the Boston Museum of Science. "Building a brain with yarn and knitting needles turns out to follow many of the same pathways as actual brain development," says Norberg. Her and Taylor's work can be seen at harbaugh.uoregon.edu/Brain/index.htm. 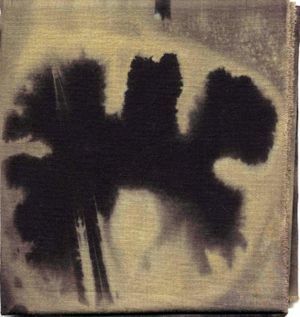 All work and images are copyright of the artists. Postscript: If you have any interesting electronic components or other items that belong on brain quilts, please email me.